"I don't understand how a human person could steal something from an innocent little child. My child hasn't done anything to anybody," said 8-year-old Ryan Lewis' mother. Ryan has cerebral palsy and depends on the wheelchair to get around. 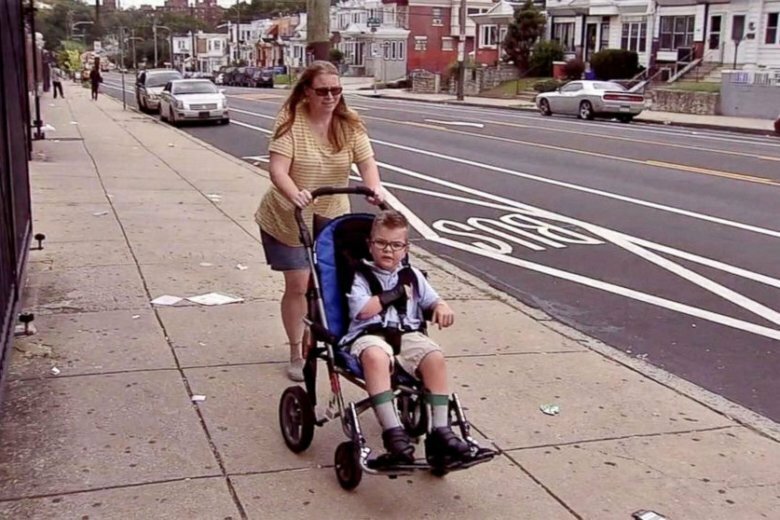 (PHILADELPHIA) — A mother is asking for her son’s wheelchair to be returned in one piece after she said it was stolen from outside her Philadelphia home last weekend. Ryan Lewis, 8, has cerebral palsy and depends on the customized electric wheelchair to get around, his mother said. Johnson, 40, has been a single parent to her son since the boy’s father died of a stroke four years ago. On Saturday, she said she and Ryan returned home after grocery shopping, and Johnson briefly left the chair outside as she carried Ryan into the house. “He has cerebral palsy. He was born with that. I don’t understand how people can be so cruel to him,” she added. Because Johnson doesn’t have a car, Ryan’s electric, custom-fitted wheelchair is key to helping them move around. While she said their insurance will replace it, it will take months for them to build it. In the meantime, she was given a temporary chair by another mom. Her friends are also fundraising to help her afford to rent a motorized wheelchair. “This generous woman dropped off her son’s old wheelchair today so he can use that to go to school,” Johnson said. But why someone would steal Ryan’s wheelchair in the first place is something she can’t understand. Rita Hertzog, 39, said she has been friends with Johnson for more than three decades. “I can’t believe somebody stole a wheelchair from a child,” Hertzog added. Hertzog said Johnson has overcome a lot of adversity. Johnson said she had a brain aneurysm eight years ago when she gave birth to Ryan. Johnson needed a few years to recover, during which her partner and Ryan’s father, Rick Lewis, quit his job to take care of them both. Four years later, Lewis died after suffering a stroke and Johnson and Ryan have been on their own ever since. Johnson is currently not working because of her condition and the demands of caring for her son. Through it all, mother and son have stuck together — and been each other’s source of strength. “She needs her son as much as he needs her,” Hertzog said. Since the theft on Saturday, people in their community have stepped up to help Johnson and Ryan. “It’s a testament to how love will always wins,” Hertzog said.